The Oatmans were a party of nine traveling West, for the California goldfields. They were Royce and Mary Ann Oatman and their children, Lucy, Lorenzo, Olive, Royce Jr., Charity Ann, Mary Ann, Roland and another on the way. The family was traveling alone, having left two other families behind in the safety of Maricopa Wells. Those families had feared Indian attacks. It was dangerous going West and even more so alone. Not long out on the trail, Royce requested aid from Ft. Yuma. They were low on supplies, horses having died, cattle on their last legs and food nearly gone. The circumstances were beginning to look stark. The aid, however, had been delayed when Indians stole it in transit. The Oatmans were camped out on the Gila River when a small group of Yavapais appeared. It was Royce’s belief that Indians would respond well to kindness and respect. In this case it would seem the Yavapais had already planned to kill the emigrants, although they claimed they had come in peace. When the Yavapais demanded food Royce explained that they had barely enough to feed themselves. This did not deter the Yavapais, who continued to insist. While the Yavapais discussed in their native tongue the family prepared to move out. Then the unimaginable happened. It didn’t take long for the Yavapais to beat the family members to death or near-death. Olive passed out as her family was picked off one by one, but later came to. Olive and Mary Ann were taken prisoner. Lorenzo who still showed signs of life was dragged away and his head bashed against a rock. He would live. When he finally regained consciousness, he stumbled about for quite some time before collapsing. Eventually Pima Indians were his rescuers. The pair cared for Lorenzo and gathered a few things from the massacre site. Then they took him to Maricopa Wells. Lorenzo battled fever but managed to survive. At Ft. Yuma the Kelley-Wilder party he had had been traveling with continued on to Los Angeles, while Lorenzo remained behind in the care of Dr. Hewitt. He [Dr. Hewitt] became a parent to me; and kindly extended his guardianship and…kindness, when the force was moved to San Diego, and then he took me to San Francisco, at a time when…I might have been turned out to wreck upon the cold world. But when the doctor pulled up stakes and went East, Lorenzo would continue to lead an unstable life. Olive and Mary Ann were forced to ditch their shoes and walk barefooted. The Yavapais couldn’t risk being tracked. Thirteen-year old Olive and seven-year old Mary Ann’s sore, bleeding feet no doubt hurt a great deal. The Yavapais pushed them hard, wanting to put as much distance between themselves and the whites as possible. Mary Ann suffered from frequent beatings when she refused to go on. She collapsed on the trail refusing to budge one inch. After her beating she was put on a horse with one of the Yavapais. 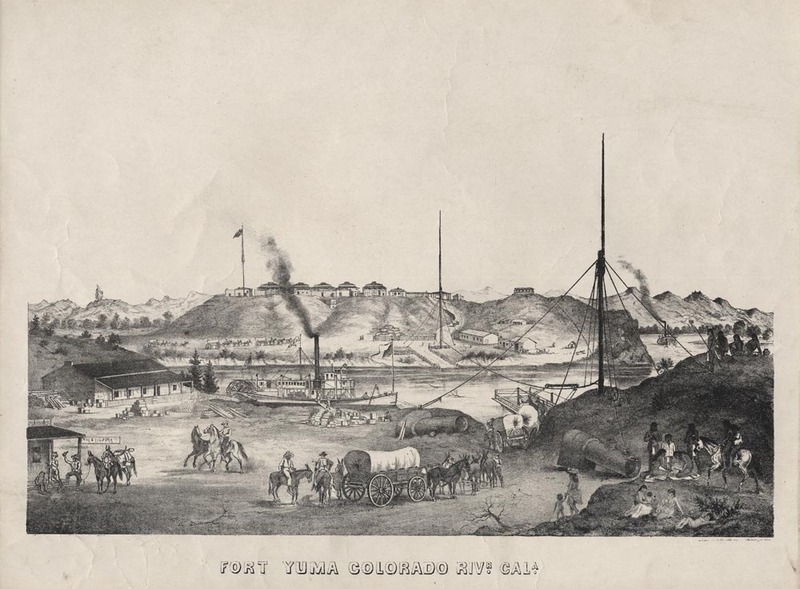 The sisters endured the murderous trip and arrived at the Yavapais camp four days later. There they were made slaves. In 1851 Mohaves, while trading with the Yavapais, offered to trade for the girls. The Yavapis were not willing to part with the Oatmans just yet. They feared the consequences should the girls come in contact with the whites. Finally in 1852 the two tribes struck a bargain. It wasn’t easy, but an agreement had been met and the girls were traded to the Mohaves. On the way to the Mohave village they were treated well and were happily received by the tribe. The Oatman girls soon learned that the tribe farmed just enough to get by and were fun-loving. They treated Olive and Mary Ann like one of their own. The pair was adopted by Espaniole and Aespaneo. They were assimilated into the Mohave culture and Olive soon received what she has become famed for. Her chin was marked with a blue, Mohave tattoo. In 1853 the tribe was starving to death. Mary Ann died as a result of starvation. Mary Ann failed fast. She and I were whole days at a time without anything to eat; when by some chance, or the kindness of the chief’s daughter we would get a morsel to satisfy our cravings. Olive wanted Mary Ann buried instead of cremated, as was the custom of the tribe, and after some pleading on the part of Aespaneo to her husband, Olive got her wish. Olive was saved from sharing Mary Ann’s fate by her ‘mother’ Aespaneo. The Mohave woman had managed to stash away a little bit of food and began nursing Olive back to health. In 1856 Olive was located through Lorenzo’s efforts to find his sisters. Espaniole didn’t want to give Olive up. Olive may not have wanted to leave. In fact, she had given Lorenzo up for dead. After Mary Ann’s death, she had thought that she was the only surviving member of her family. But after arguments and debates Olive was traded. She was taken to Ft. Yuma. There the fort greeted her as if receiving their long lost daughter. Lorenzo and Olive were reunited at long last. Later a cousin convinced them to come with him to Gassburg , Oregon. In Gassburg they worked at the Oatman Hotel. During this period Olive had become deeply ashamed of her tattoo and tried to hide it behind her hand. When a man by the name of Royal Byron Stratton came into the Oatman siblings’, life things began to change. He wrote a book on their experiences. Although it was largely a work of fiction, it quickly became popular. Olive and Lorenzo worked with Stratton to promote the book, touring the US. It had become their source of income. They were even allowed an education, which they had lacked for so long and in need of. In 1859 Olive lived with Stratton and his family and began speaking publicly to promote the book. Two years later she was attending a normal school to become a teacher. From then her life seemed to take a turn for the better. She now had a means of supporting herself. In 1865 she married John Fairchild a Michigan farmer. She happily settled into her new life, although a bit reclusive. In 1872 they had moved to Sherman, Texas. There they adopted a baby, Mary Elizabeth ‘Mamie’ Fairchild. They lived a comfortable life, but Olive began having severe eye problems. Her eyes pained her and at one point she couldn’t see out of one. In 1901 Lorenzo died. Olive followed him in death in 1903 having suffered a heart attack. If you would like to learn more of Olive Oatman, you may consider The Blue Tattoo by Margot Mifflin. To tell the truth I didn’t really enjoy the book. It seemed to concentrate on other ridiculous aspects of Olive which I found to be disgusting and inappropriate. Still it contains info on Olive which would interest any reader wanting to know more. Just be prepared to do some sifting. Alot of sifting. Oh wow ! That was an amazing story. Do you know how they did tattoo’s back then in Olive’s time ? By the way, I was wondering if you are homeschooled ? I am and I was wondering if you were too. It was explained in the book, and if I remember correctly it was a painful process. She now Stars on “Hell on Wheels” TV show! Not for the weak-willed or faint of heart to make such trips West. No, it wasn’t. We are so spoiled today and whine about the most minor thing (me: guilty!) while these people went through really hard times.